Level 1 will be an integrated support hub where students can access a range of support, study, enrolment, technology, library and other services. Levels 11 to 14 will be occupied by commercial tenants. Levels 2 to 7 will be furnished using a different colour and will contain 20 computer workstations distributed throughout the area, a mix of private and open work spaces, lockers for storage, tea and coffee making facilities and four learning studios that can each accommodate between 50 and 60 students. In addition to the building's rich Wi-Fi connectivity, these highly interactive spaces will also contain a number of whiteboards and moveable tablet stands. A video has been produced (see below) to demonstrate how the spaces can be utilised by students. A number of student information sessions on the new Parramatta City campus were held in over the past few months. Professor Sara Denize, Acting Dean of the School of Business, conducted one of the information sessions and Stuart Penny, Senior Project Manager from Information Technology and Digital Services, provided an overview of the new campus, specifically focusing on technology. Students also had the opportunity to ask a range of questions. If you missed the session please watch the video of the livestream below. Please find below further information about the new Parramatta City campus. Why is the University opening a new campus in the Parramatta CBD? A multi-storey presence in Parramatta CBD marks the start of an exciting new era for the University. It will contribute to the University's plans to expand its course offerings in Parramatta and provides an opportunity to co-locate with business and industry partners. It's also close to the Parramatta Transport Interchange making it easily accessible by public transport. Why is the School of Business moving there? It will place the School at the centre of a vibrant community, with opportunities to work more closely with business and industry partners to expand industry-engaged research, and ensure student learning aligns closely with professional practice. It also exposes students to more technology rich environments which they can expect to experience in the workforce. What if I'm a School of Business student at Campbelltown or Bankstown? If your classes are currently held at Campbelltown or Bankstown they will continue to be held on those campuses. If you choose a subject in future that up to now has been held at Parramatta South campus, then this will move to the new Parramatta City Campus in 2017. What does the new campus mean for existing students? What if I need to go to Parramatta South campus? A shuttle bus service will run between Parramatta South, Parramatta North and Parramatta City Campus. The shuttle bus timetable and routes will change from 19 December 2016 to accommodate the needs of students and staff travelling to the new campus. The bus stop will be located immediately outside the Macquarie Street entry to the new campus. Current bus stops near 100 George Street and Parramatta Railway Station will no longer operate. Bus stops on Parramatta South and Parramatta North campuses will remain unchanged. During peak times, seven buses will operate between Parramatta South, Parramatta North and Parramatta City campuses in a circular route. Four buses will operate in one direction during peak times and remaining buses will operate in the opposite direction. The direction of travel will be adjusted as much as possible to meet demand. Given the proximity to the Parramatta transport hub, students and staff will be encouraged to explore public transport options. General student and staff parking will not be available at the new campus. There are other parking alternatives in the Parramatta CBD and the University is seeking to negotiate special rates at local council car parks. More details will be communicated as negotiations progress. Will shuttle bus services change to meet the needs of the new campus? A significant number of students and staff will move from Parramatta South campus to the new Parramatta City Campus. This means we will need to reconsider our current transport services to make sure we meet the shift in demand. Shuttle bus services between Parramatta South, Parramatta North and Parramatta City campuses will change from 19 December 2016. Of course, we will not be able to fully anticipate the shifts in demand until students and staff have settled into the new campus and adjusted their travel arrangements to meet their personal needs. We will therefore closely monitor shuttle bus services and make adjustments where needed. Will shuttle buses run to a timetable? Shuttle buses will run on a predetermined route between set starting and finishing times. Between those times, the schedule largely depends on the numbers of passengers getting on/off and traffic. We will undertake to provide a regular and reliable service (e.g. every 10-15 minutes if possible). You can track each bus in real time on your desktop or mobile device. Just search for transport on the University's website, or download the 'Western' app on your mobile device. At Parramatta City campus, you can use the Campus Navigator to check when the next shuttle bus is due to arrive. There are also easily accessible public transport options. How will security be managed in the new building? The safety and security of students and staff is a high priority for the University and the new campus will provide the same high level of security as other campuses. This includes a 24/7 security presence for the building and after-hours access via ID card. What student services will be available at the new campus? All of the usual student services will be available from the new Parramatta City Campus. These services will be delivered using a new approach to make it as easy and convenient as possible to access services. What facilities will the new building have? For a summary of the facilities of the new Parramatta City Campus, see the 'Overview of Parramatta City Campus' document. Will the Wi-Fi in the new building cope with demand? The building will be equipped with the latest Wi-Fi technology which will offer greater capacity, coverage and resilience than our existing Wi-Fi services. The new Wi-Fi technology will be implemented at Kingswood campus and load tested before it is rolled out to the new Parramatta campus. How will the library service at the new campus work? The new campus will operate a library hub, based on a digital-preferred resource model. Students and staff will be able to access our extensive online resources from their own devices, or via computers available throughout the campus. The hub itself will house a small collection of any Reserve materials which are not available online, and offer a physical inter-campus collection service (similar to other Western libraries). Library staff on site will provide scholarly information services to students and staff, including assistance with information discovery, assignment question analysis, citation and referencing, as well as the Library Study Smart service (formerly library roving service). Will the new campus have dedicated space for the Student Representative Council and the Parramatta Student Campus Council? Level 1 of the new Parramatta City Campus has a range of facilities including a dedicated space for SRC and SCC use. The SRC and SCC will also have the ability to book meeting and event space within the building for appropriate student representative activities. Will there be dedicated Peer Assisted Study Session (PASS) spaces? The new campus offers a range of quiet meeting and study spaces which can be booked for Peer Assisted Study Sessions. Options will be discussed with the PASS Coordinator as part of the relocation process. What kitchen facilities will there be for students and who will maintain them? Tea points are available on all floors throughout the building and students will be encouraged to use these facilities on any of the teaching floors (i.e. levels 2–7). There will also be food outlets on the ground floor. The operations of the building are currently being planned and we expect that the maintenance and re-stocking of kitchen supplies will be the responsibility of cleaning staff. What facilities will be available for events? The event space on level 9 offers two flexible multi-function spaces that can be divided into separate spaces by a moveable wall. Each space can accommodate around 140 people. The floor will have kitchen facilities to support catering for functions but there will not be a retail food or drink outlet. Level 9 also provides access to a terrace where students and staff can bring their lunch unless the space has been booked for a formal event. Student and staff groups may also book the space for appropriate events. Will the facilities be suitable for students with a disability? The building design has taken into consideration the needs of people with disabilities and meets required standards. The learning studios have also been developed with this in mind. A group of Disability Advisors recently reviewed the learning studio prototype so they can take the facilities into consideration when developing Academic Integration Plans (AIP). They also provided input into specific furniture requirements. Who will be the commercial tenants on level 11 to 14? Level 11 will be occupied by Price Waterhouse Coopers which will provide exciting partnership opportunities. Details of other tenancies are still being negotiated and will be communicated once these are finalised. For up-to-date information visit the Parramatta City progress page. What food and retail outlets will be available on the ground floor? Details are still being negotiated and will be communicated once these are finalised. Will the building cope with the large numbers of students moving between classes? As a commercial building, the design has taken into consideration the movement of large numbers of people (e.g. an additional lift has been installed and teaching floors are connected by escalators and/or stairs) to ensure there is adequate space. Consideration is also being given to providing a 10 minutes change over period between classes. How will queues be managed? The new campus will be supported by a range of technology solutions including a customer flow management system. This will allow students to make appointments using their mobile, laptop, tablet or on-site kiosk. Students can then make use of other facilities (i.e. study spaces, social spaces, retail outlets etc) throughout the building until their turn comes. The system will be tested at Kingswood campus during July before it is implemented at Parramatta South and the new Parramatta City campus. Will there be signage throughout the building to help people find their way around? Each level of the Parramatta City campus will be equipped with a Campus Navigator, which is an interactive digital way-finding service. For more information, read the Campus Navigator Fact Sheet (opens in a new window). Will all classes now be 'technology' based? Although the new learning studios have been equipped with the latest technology, it doesn't mean you need it for all classes. The spaces work just as well for traditional group work, although the technology does open up new and innovative ways of learning and teaching. Will academic staff be trained in using the new learning studios? Professional development sessions and support material are available to teaching staff. 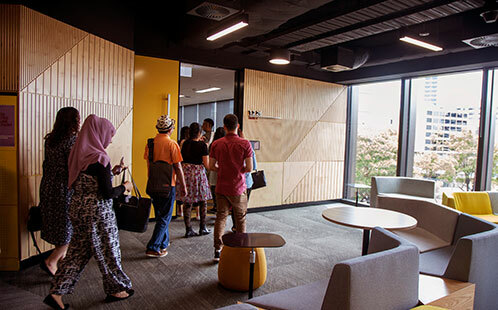 The School of Business is actively trialing the learning studio at Parramatta South campus and will use learning from those sessions to ensure all staff are trained in the use of the new spaces. Will students and student groups be able to book rooms in the new campus? The campus will be equipped with a new room booking system for all bookable spaces. Students, student bodies and staff will be able to book quiet and meeting spaces. Details of how the new booking system will work will be communicated at the time of the relocation. How can students prepare for the new learning studios? A range of support materials are being developed for students to help them become familiar with the new spaces. Students will also have an opportunity to participate in a walk-through of the new learning studio so stay tuned for updates. For a quick overview of the new learning studios, please view the student orientation video at the top of this page. Will there be site orientations before the new teaching session begins? We plan to conduct site visits later this year. Details will be communicated closer to the time. How can students keep up to date on progress? Please check the Parramatta City campus website regularly for updates on progress and important information.